The following story originally appeared in the summer 2014 issue of the William & Mary Alumni Magazine. - Ed. Robert Mann ’81 is standing at a sink. The sink is in an old, dingy house with a long dirt road running in front and a coal pile in the backyard. Perhaps it is in West Virginia somewhere; he’s not quite sure. Mann takes a glass and fills it with water from the sink. Then he puts soap in it. Somehow another inhabitant of the house, a member of Mann’s family, drinks the water and dies. Everyone else in the family blames Mann, and he is given away. Mann doesn’t know if this recurring dream he had as a kid is based on an actual incident or is random. What he does know is this: when he was 3 years old, he was in fact given away. Today, Mann is a forensic anthropologist and director of the Forensic Science Academy at the Central Identification Laboratory in Hawaii, the largest forensic skeletal lab in the world. 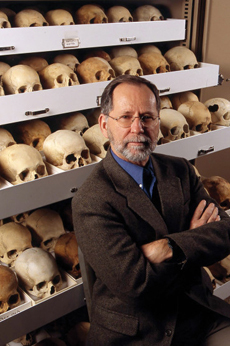 A member of the American Board of Forensic Anthropology, Mann has assisted law enforcement agencies with the recovery and identification of human remains, sometimes traveling to the world’s most dangerous and remote places. From serial killer Jeffrey Dahmer’s first victim, to the soldier in Vietnam’s Tomb of the Unknown Soldier, to victims of the Pentagon plane crash on 9/11, Mann has examined more than 4,000 ancient and modern human skeletons during his career, searching for clues to their identity — which is ironic because he got his start in the field by searching for his own. Born in a coal-mining town in West Virginia as Robert Dean Churchwell, Mann doesn’t remember much about life in his early childhood, but his adoptive mother told him that he had a difficult childhood, speaking little and mostly keeping to himself until the age of 3. In Tampa, Fla., with his adoptive family, Mann’s grandfather took him fishing. Mann would often climb into the dumpster in the parking lot of Beezee’s Drugstore, searching for anything interesting. He chased grasshoppers in the backyard. It was a normal childhood. But he always wondered who he was and how he ended up as someone else’s child. It was a thought he could not escape. By the time he was 15, Mann had read the works of Sigmund Freud and Carl Jung and wanted to follow in their footsteps, but he struggled in school. Mann dropped out of high school his senior year. He thought he was going to be a rock star, but it turned out he didn’t have the skills for it. He joined the Navy for a few years, then became a hippie, hopping trains and hitchhiking across the country, once with a guy named Nasty. When Mann needed to eat, he would pop into a diner for a “Hobo Float” — which consisted of a toothpick and a glass of water — then swipe the crackers left out for paying customers who had ordered soup. When he needed money, he would find a job, working about 30 different ones by the time he was 29. His nickname was Ghost because sometimes he would disappear without warning, going out for a pack of cigarettes and never coming back. Mann claimed his finest hour came when he woke up drunk on a beach in Tampa, surrounded by beer bottles, as a crowd of people waited for police to remove him so they could start their Easter Sunday mass. “The one thing that no one can take away from you is your education.” It was something his mom had said many times. In 1976, it finally sunk in. Having earned his GED in the Navy, Mann enrolled at Tidewater Community College in Portsmouth, Va. After earning his associate’s degree, he applied to William & Mary on a whim, still searching for what he wanted to do. He found it in an introductory anthropology course. One day for class, Mann was doing volunteer work in the Wren Building, numbering pieces of broken pottery and arrowheads, when the lab archaeologist came up to him and handed him a bone. “What is this?” he asked Mann. “Like a genius, I said, ‘It’s a bone.’” The archaeologist proceeded to tell Mann that the bone belonged to a young, domesticated turkey. “How can you tell all that?” Mann asked him. “Just by looking at it,” the archaeologist replied. It fascinated Mann that life’s events were recorded in bones. He enrolled in an osteology class at the College, where his professor told him he had a real knack for the subject and that he should go study under the best person out there. That person was the author of the textbook he was using at William & Mary, Dr. Bill Bass at the University of Tennessee. Down a dirt lane in a heavily wooded area not far from the Alcoa Highway in Knoxville, Tenn., is a place known as the Body Farm. When Mann arrived there in the 1980s, it was a simple structure — just a small area, not much larger than a backyard, sectioned off by a chain link fence to keep out large animals and pranksters. Inside the fence lay six or seven bodies in varying stages of decay. “Contrary to what the name suggests, bodies don’t grow there,” Mann said. “Instead weeds, flies and maggots do — in abundance.” According to Mann, “It’s a school for the living, taught by the dead.” Bass established the research facility in 1972 not only to house unidentified and unclaimed bodies when they were no longer needed by police for evidence, but to study what happens to a body after death, providing the medical and legal community with information based on field studies. But Mann almost didn’t make it to the Body Farm. It turns out Mann did. But although he received A's in his courses, he still didn’t have the confidence that he was going to be able to do anything with his life. He called Dr. Bass and told him he was going to drop out. But Dr. Bass convinced him to stick with it. As a graduate student, Mann had the opportunity to serve as Dr. Bass’ teaching assistant, working cases with him at the Body Farm. Then known as the Anthropology Research Facility, students and faculty at the Body Farm conducted studies to answer questions police had. “How long has this body been here? No one had answers based on controlled studies,” explained Mann. While medical examiners can usually determine the time since death of someone who has died within the past 24-48 hours, once decomposition begins, it’s a whole other area of expertise. That’s where research done at the Body Farm comes into play. Bodies here are buried at different depths, or placed on concrete. Some are wrapped in plastic, others in sheets. Data is collected in all seasons to see how long it takes a body to become a skeleton and establishing how much time has passed since death, information that can be crucial in solving crimes. Findings are published and used all over the world. Mann’s experiences at the Body Farm gave him the confidence to start a career in forensic anthropology. The third floor of the Smithsonian is known as “America’s Attic,” housing the bones of 3,000 individuals, some identified, some not. It was here that Mann went to work after graduating from Tennessee in 1987, and it was here that he was working when the bones of Steven Hicks, Jeffrey Dahmer’s first victim, came to the Smithsonian to be identified. “Few people realize how difficult it is to destroy a body completely,” said Mann. But Dahmer sure tried. After strangling Hicks, Dahmer defleshed the body and smashed the bones with a sledgehammer, throwing the fragments into the woods behind his boyhood home in Ohio. Mann and his boss set out the remains on trays, sorting each bone fragment according to which part of the body it came from. They estimated they had less than 20 percent of the complete skeleton. It took nearly a month to undo Dahmer’s damage to Hicks’ bones, but during the reconstruction, Mann and his partner found two crucial pieces of evidence. A neck bone and a tooth helped them identify Hicks by comparing a dental X-ray Hicks had when he got braces at 13. At the burial ceremony of box X-26 into the Vietnam Tomb of the Unknown Solider in 1984, President Ronald Regan said, “We write no last chapter. We close no books. We put away no final memories.” Mann brings these words to life everyday. 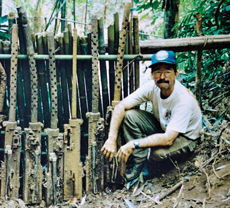 Mann has traveled to places such as Vietnam, South Korea, Russia and Laos, extracting the remains of individuals lost in battle, bringing them back to the lab and working to identify them. “It is an Indiana Jones kind of job,” Mann said. “You go to work in a helicopter or a bamboo raft. You’re in the jungles of Laos or you may be digging in Russia. There are real dangers.” As teams dig with shovels and pickaxes, one of those dangers is bombs, as a team once took out 18 100- pound bombs from a plane crash site. But sometimes Mann works in our nation’s own backyard. In 1998, a CBS broadcast claimed that a seven-month investigation revealed that the identity of the Vietnam unknown solider was Michael Blassie, an Air Force lieutenant who crashed into enemy territory in 1972. The broadcast caused a stir, and while the government had an obligation to the American veterans who viewed the tomb as sacred ground, it also had an obligation to family members with unresolved questions and to the military’s promise to identify every one of its fallen soldiers. While the remains had seemed unidentifiable at the time of burial, new advances in technology might be able to prove who was in box X-26. It was decided the tomb would be opened. It took more than four hours to slice through the 10 inches of granite around the tomb. Mann’s role was to oversee the anthropological work that would provide specimens for examination. 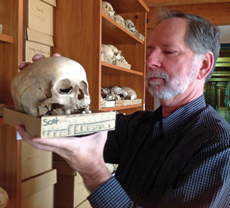 Mann and another CIL anthropologist analyzed the remains and came up with identical findings. They believed X-26 was between 30 and 40 years old when he died and stood about 5 feet 8 inches. After the initial analysis, bone samples, about the size of postage stamps, were sealed in plastic bags and submitted for DNA testing. DNA, first identified in 1944, is easily destroyed, and DNA found in bones that have been burned, as was the case with X-26, are contaminated. That’s why the remains of X-26 were considered unidentifiable when they were buried in 1984. But the discovery of mitochondrial DNA (mtDNA) in the 1990s means there may never again be an unknown soldier. Mitochondrial DNA is useful in identifying older skeletons not only because it is more plentiful than nuclear DNA, but also because we receive our mtDNA from one source, our mother. Every child’s mtDNA is identical to his or her mother’s and their mother’s blood relatives. In the case of X-26, scientists compared the mtDNA in the bone samples to the mtDNA in a blood specimen Pat Blassie, Michael’s sister, had donated. They matched exactly. The stench of death and burned flesh was overwhelming as more than 200 dead bodies arrived by helicopter to the back door of a converted hangar. The hangar was separated into examination rooms, each filled with the buzz of activity as groups of forensic anthropologists, forensic pathologists, radiologists, fingerprint technicians and embalmers worked with the bodies. In a back room were the personal effects. Tables were lined with magazines, shoes, car keys and family photographs. One table contained a woman’s watch stopped at 9:43, one hour and 43 minutes after her plane took off. This was the scene at the Dover Port Mortuary at Dover Air Force Base in Delaware five days after Sept. 11, 2001. At his home in Hawaii, Mann had been woken up the morning of the 11th at 5 a.m. by a ringing phone. Either a prank or a wrong number, there was silence on the other end. Mann, realizing he couldn’t go back to sleep, turned on the TV. New York City was on fire. As news of the plane crash at the Pentagon reached Hawaii, Mann wondered if his team would be called into action. Three days later, the Armed Forces Institute of Pathology, handling the Pentagon identification operation, asked the CIL for four anthropologists. Mann arrived at the Dover Mortuary on Sept. 16 and went to work. In mass disasters, like the attack on the Pentagon, forensic anthropologists are valuable in associating body parts and small pieces of bone with individual victims, and with distinguishing pieces of bone from other items like plastic and rubble. While working to identify victims, Mann held their disembodied hands, some adorned with wedding rings, a grim reminder there were family members somewhere in search of their loved ones. Although Mann has studied countless bodies, each case is still an emotional drain. “I don’t think anyone can ever get so accustomed to dealing with remains that they feel nothing,” Mann said. The Pentagon case was no exception. Mann walked slowly among the table of personal effects. By Sept. 22, most of the bodies had been removed from the Pentagon, but the identification process would go on for months. In the end, one child on the plane and four people on the ground could not be identified, but scientists did get DNA sequences for the five terrorists. One time while in Laos, surrounded by local children, Mann passed out some Oreos. He watched as one girl untwisted the cookie, licked out the cream, then ate the rest of it, the exact same thing he had done as a child in Florida. As an anthropologist, Mann studies people. And he’s learned a few things about them along the way. Mann hadn’t given up either. “I often wondered if I pulled up to a stoplight, if I turned and looked to my left or my right, was I looking at my brother or sister?” Now he knew. And either way, Robert Mann has come home. And he continues to help others do the same.